ONE LEGENDARY STREET. TEN UNEXPECTED STORIES. 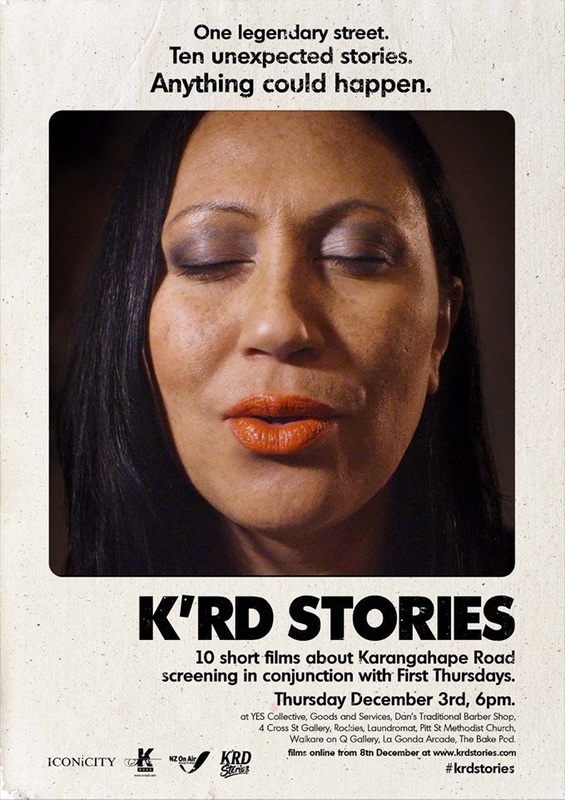 ANYTHING COULD HAPPEN.K' Rd Stories cracks open the surface of life on Karangahape Road, revealing diverse cultures and unique voices. Set on New Zealand’s most iconic street this collection of short films - by some of New Zealand’s most creative filmmakers - explores the uncommon, the contrasting, and the crazy. The films premiered along an innovative screening trail on Karangahape Road in conjunction with First Thursdays on December 3rd, 2015. K Rd Stories sneaks a peek at the people and places that make this neighbourhood so infamous - and so beloved. “I remember walking down Karangahape Rd with my parents and being a bit scared of the bright lights and bright people. As an adult I worked in hospitality and got to know a lot of the K'Rd staff. It became the go-to place to hang after a night's work of bartending in the city. It was important to me to make AROHA true for the K'Rd community who live and breathe it every day. I decided to write a story about ‘aroha’ - or love - as that was something that I knew about. Then I wanted to bring a real K'Rd person into the mix of the film. Boom - enter Ramon Te Wake who stars as Jade. Ma is a story about a Samoan grandmother trying to survive her worst fear – being alone. Ma’s Sunday begins like any other with a visit to Church. Ma's approached by the church Bishop with accusations of coercing an elderly women's group to a nightclub. Ma leaves the Bishop in disbelief, proudly revealing that they had a wonderful time and they all still believe in God. When she arrives home Ma notices that one of her precious soft toys is missing. Infuriated, Ma does some quick detective work on the phone before heading out for church. Along the way she experiences a rude, inappropriate driver who she follows and stealthily confronts in a local car park, teaching him a lesson that he'll never forget. Ma is no ordinary grandmother. She's strong-willed, opinionated and can take on the toughest, and usually does. But under the rock hard exterior is an old woman trying to endure what's left of her existence and reclaim the feeling of control that she once had in her younger years; the feeling of being needed.​Ma is a story about one woman's strength, weakness, love and humanity in a world that has almost forgotten her. Leiataua Afega 'Ma' Si'ulepa is 81 years old. She comes from a small village called Solaua, in the independent Polynesian island of Samoa. Ma has lived in New Zealand for most of her life. In 2013 Ma starred in a short film about her life as a widowed matriarch grandmother who returns home one day to find her precious toy monkey is missing. In 2014 Ma travelled with the film to the Hawaii International Film Festival and the LA Skins Fest in the USA. It was the first time Ma had ever experienced anything like it. Ma - Short Film Trailer from Nikki Thunder on Vimeo. In the 1970's the world's biggest threat entered the world's smallest village and the Pacific was never the same again.